June 19, 2017 - According to research published in the Southern Journal of Applied Forestry 35(4), using in-forest weighing scales can boost the payload efficiency of log trucks. The 2011 study titled “Improving Log Truck Efficiency by Using In-Woods Scales” by authors Ryan Reddish, Shawn Baker and Dale Greene, evaluated the effect of using truck scales and platform scales in the forest for weighing timber. The results of this comparative research were quite promising. While tare weights were only 108 lbs. higher, net payloads were 1,799 lbs. higher in trucks using scales than in those without scales. Payload variation was 38 per cent higher in trucks without scales, as compared to those using in-forest weighing equipment. Without scales, timber haulage costs were $7.74 per ton, but these dropped by 4 per cent (to $7.44 per ton) while using scales. With rising fuel costs, the savings from more efficient payload management can add up to a significant amount over time. And, as the research shows, using truck scales, crane scales, platform scales and other weighing equipment in the forest can help you optimize truck payloads and boost profitability. With a “decoupled” approach for cut-to-length or CTL harvests, wireless crane scales and weigh links aim to maximize production by enabling each piece of equipment to operate independently. How wireless weigh links work: The forwarder operator initiates the weighing sequence by pushing a pedal, and weight measurements of the grapple-bite of wood are taken up to 10 times per second for a few seconds. The weight is then calculated using a special algorithm and motion control features, stored in the computer, and the next sequence can begin. This is repeated over a week, at the end of which the stored readings can be used to track production. Wireless crane scales help with estimating processor and forwarder production as well as log truck payloads, since weight readings are easily available for each load. They improve accuracy at many stages, from piling timber along the roadside and in-woods loading to making pay-as-cut payments to landowners. 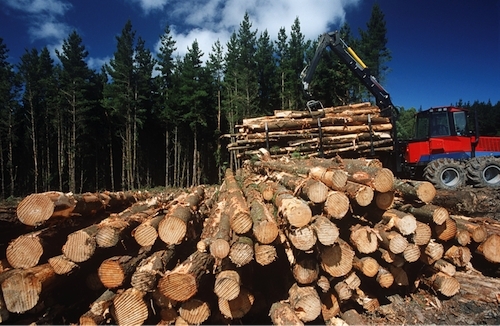 The relationship between weight and volume of wood is affected by solid and bulk density, dry matter and moisture content in wood, as well as vehicle payloads constraints. These add to the complexity of getting accurate measurements, but they need to be taken into account while weighing payloads. Truck scales are generally used to check a vehicle’s payload while it’s on the road, but this may be difficult to achieve with fixed-location scales in forestry and woods applications. However, on-board truck scales and other in-forest weighing systems can help reduce variations in Gross Vehicle Weight, or GVW, to boost efficiency in payload transportation. Payload weight can increase by anywhere from 0.22 to 0.73 tons with even a 1 per cent decrease in GVW variability, and fully loaded trucks have a significant impact on ROI. Truck scales help minimize GVW in two ways. First, by reducing the possibility of vehicles hauling light payloads, and secondly, avoiding potential overweight fines and penalties. In addition to optimizing logistics by weighing vehicle payloads, in-woods weighing systems can help in other logging applications as well. For instance, using wireless weigh links with knuckle boom loaders can help you save time while loading log trailers to the maximum legal limit. Instead of moving the vehicle onto a scale and weighing it each time you add or remove logs, you can get an accurate weight reading while it’s being loaded. However, using the loader with a heel boom to control a tree will affect its hanging weight. There’s a wide range of weighing solutions available for every industry today, so explore your options to see what might work for you!